In contrast to the infrequency of CH, medulloblastomas are the most common malignant brain tumors of the posterior cranial fossa in children, being generally associated with several familial cancer predisposition syndromes. [5-7] Although café-au-lait lesions occur with variable frequency in a number of disorders, such as neurofibromatosis types 1 (NF1) and 2, Albright syndrome, among others, , to the best of our knowledge this phenotype has never been reported before in association with a non-radiation-induced brain CH and medulloblastoma. A 13-month-old boy, with consanguineous parents, was referred to the Pediatric Emergency Department of our hospital with partial-complex seizure. Clinical evaluation revealed normal neurological development and no focal deficits. No iris nevi or Lisch nodules were evident on ophthalmological examination. Prominent café-au-lait skin lesions were observed on the patient's neck and midchest [Figure 1]a-c. His father and brother had similar dermatologic signs, the latter having died at the age of 6 years due to T-cell acute lymphocytic leukemia. He also had an older brother who died owing to congenital heart disease [Figure 1]d. MRI of the brain showed an isolated lesion in the left mesial-temporal lobe [Figure 2]a. Microsurgical total removal of the lesion was performed. Histological diagnosis confirmed a typical cavernous hemangioma. The patient had an uneventful postoperative course and was discharged after four days. Outpatient consultations were performed routinely. At the age of 4 years he presented with a 7-day history of progressively worsening headache, vomiting, and gait ataxia. Ophthalmological evaluation revealed papilledema. MRI scans showed supratentorial hydrocephalus associated with a posterior fossa tumor in the left cerebellar hemisphere displacing the brainstem [Figure 2]b. Thorough neuroimaging screening of the neuroaxis showed no other lesions at that time. Gross total resection was achieved by suboccipital craniotomy. Histological examination of the tumor revealed a nodular medulloblastoma grade IV (WHO). The patient underwent radiotherapy and chemotherapy. 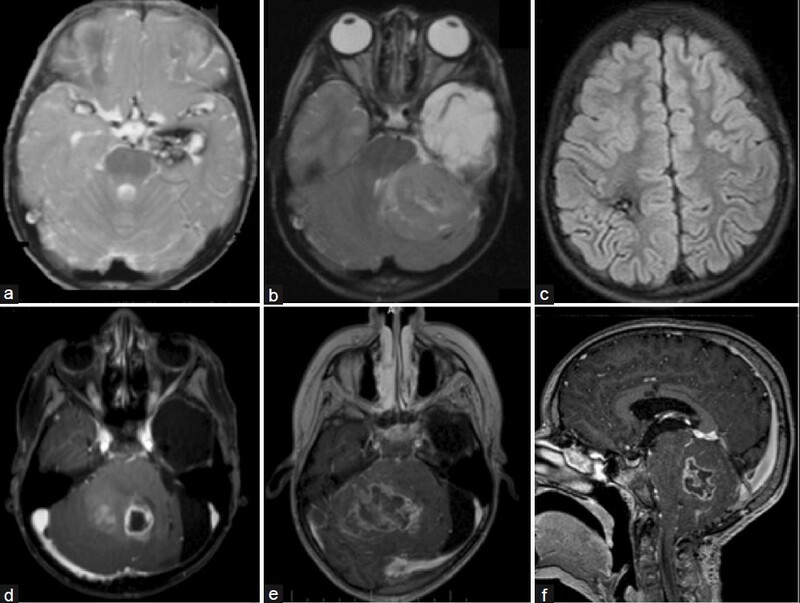 Five years later, control MRI scans confirmed no recurrence of the lesion, however showed multiple and asymptomatic radiation-induced cavernous hemangiomas [Figure 2]c. At the age of 10 a massive recurrence of the medulloblastoma was observed in the posterior fossa associated with severe hydrocephalus [Figure 2]d. Initially, an endoscopic third ventriculostomy was performed uneventfully. A surgical resection was attempted with the aim of reducing the lesion. In spite of aggressive adjuvant treatment, the child died 3 months later due to infiltration of adjacent brain stem and clinical complications [Figure 2]e, f.
Recent publications have documented the de novo formation of CH following radiation treatment. ,,, Venous restrictive disease has been postulated to be a consequence of impaired venous flow caused by radiation change. This impairment increases venous pressure and may lead to the formation of cavernous hemangioma. A cumulative increase of radiation-induced CH occurs over time in children who receive cranial radiation therapy. In our case, the CH diagnosed in the mesial temporal lobe was obviously not related to radiation. Posterior fossa tumors associated with NF1 are very infrequent, ,,, differently from those tumors located in other regions, such as optic pathway tumors and brain stem tumors, which are common and histologically benign. Therefore, medulloblastoma is a typically malignant cerebellar tumor of infancy rarely associated with NF1 clinical features. In view of these facts, our case has been extensively analyzed in order to define a syndrome that could explain the presence of NF1 clinical features associated with non-radiation-induced brain CH and posterior fossa medulloblastoma in a child with consanguineous parents. Therefore, the Department of Genetics of our university has investigated whether the patient's presentation was related to constitutional mismatch repair-deficiency (CMMR-D). Heterozygous germline mutations may cause Lynch syndrome, an autosomal dominant cancer syndrome associated with hereditary nonpolyposis colorectal cancer, endometrial carcinoma, and other malignancies, generally occurring in the fourth and fifth decade of life. In contrast, rare cases of biallelic deleterious germline mutations in MMR genes leading to CMMR-D have been recognized since 1999. , This cancer syndrome is characterized by a wide spectrum of early-onset malignancies such as hematological, brain or gastrointestinal cancers and a phenotype that resembles NF1. Interestingly, several reports stress that café-au-lait macules differ from typical NF1-associated lesions in that they have variable degree of pigmentation, irregular borders, and, usually, a segmental distribution pattern. Other features of NF1 found in CMMR-D patients include Lisch nodules, neurofibromas, skinfold freckling, and tibial pseudarthrosis. Hence, it is not surprising that a number of CMMR-D cases were initially diagnosed as NF1. , It has been speculated that NF1-like clinical features in CMMR-D patients result from germline mosaicism arising early during embryonic development. There are data supporting the hypothesis that the NF1 gene is a mutational target of MMR deficiency. The diagnosis of this deficiency should be confirmed by gene-specific mutation analysis. The use of such analysis may facilitate identification and surveillance of heterozygous and homozygous individuals in the wider family, in addition to allowing for informed decision-making about prenatal genetic diagnosis. The authors thank Clarissa Picanço, M.D., for her assistance in genetic analysis. 1. Moriarity JL, Clatterbuck RE, Rigamonti D. The natural history of cavernous malformations. Neurosurg Clin N Am 1999;10:411-7. 2. Musunuru K, Hillard VH, Murali R. Widespread central nervous system cavernous malformations associated with café-au-lait skin lesions. J Neurosurg 2003;99:412-5. 3. Baumgartner JE, Ater JL, Ha CS, Kuttesch JF, Leeds NE, Fuller GN, et al. Pathologically proven cavernous angioma of the brain following radiation therapy for pediatric brain tumors. Pediatr Neurosurg 2003;39:201-7. 4. Lew SM, Morgan JN, Psaty E, Lefton DR, Allen JC, Abbott R. Cumulative incidence of radiation-induced cavernomas in long-term survivors of medulloblastoma. J Neurosurg 2006;104:103-7. 5. Banka S, Walsh R, Brundler MA. First report of occurrence of choroid plexus papilloma and medulloblastoma in the same patient. Childs Nerv Syst 2007;23:587-9. 6. Louis DN, Ohgaki H, Wiestler OD, Cavenee WK. Familial tumour syndromes. In: Louis DN, Ohgaki H, Wiestler OD, Cavenee WK, editors. WHO Classification of Tumours of the Central Nervous System. Lyon: IARC; 2007. p. 205-35. 7. Robles Cascallar P, Contra Gómez T, Martín Ramos N, Scaglione Ríos C, Madero López L. Association of neurofibromatosis type 1 and medulloblastoma. An Esp Pediatr 1992;37:57-8. 8. Maeder P, Gudinchet F, Meuli R, de Tribolet N. Development of a cavernous malformation of the brain. AJNR Am J Neuroradiol 1998;19:1141-3. 9. Poussaint TY, Siffert J, Barnes PD, Pomeroy SL, Goumnerova LC, Anthony DC, et al. Hemorrhagic vasculopathy after treatment of central nervous system neoplasia in childhood: Diagnosis and follow-up. AJNR Am J Neuroradiol 1995;16:693-9. 10. Corkill AGL, Ross CF. A case of neurofibromatosis complicated by medulloblastoma, neurogenic sarcoma and radiation-induced carcinoma of thyroid. J Neurol Neurosurg Psychiatr 1969;32:43-7. 11. Martínez-lage JF, Salcedo C, Corral M, Poza M. Medulloblastomas in neurofibromatosis type 1. Case report and literature review. Neurocirurgia (Astur) 2002;13:128-31. 12. Meadows AT, D'Angio GJ, Miké V, Banfi A, Harris C, Jenkin RD, et al. Pattern of second malignant neoplasms in children. Cancer 1977;40:1903-11. 13. Pascual-Castroviejo I, Pascual-Pascual SI, Viaño J, Carceller F, Gutierrez- Molina M, Morales C, et al. Posterior fossa tumors in children with neurofibromatosis type 1 (NF1). Childs Nerv Syst 2010;26:1599-603. 14. Wimmer K, Etzler J. Constitutional mismatch repair-deficiency syndrome: Have we so far seen only the tip of an iceberg? Hum Genet 2008;124:105-22. 15. Wimmer K, Kratz C. Constitutional mismatch repair-deficiency syndrome. Haematologica 2010;95:699-701. 16. Péron S, Metin A, Gardès P, Alyanakian MA, Sheridan E, Kratz CP, et al. Human PMS2 deficiency is associated with impaired immunoglobulin class switch recombination. J Exp Med 2008;205:2465-72. 17. Ricciardone MD, Ozcelik T, Cevher B, Ozdag H, Tuncer M, Gurgey A, et al. Human MLH1 deficiency predisposes to hematological malignancy and neurofibromatosis type 1. Cancer Res 1999;59:290-3. 18. Wang Q, Lasset C, Desseigne F, Frappaz D, Bergeron C, Navarro C, et al. 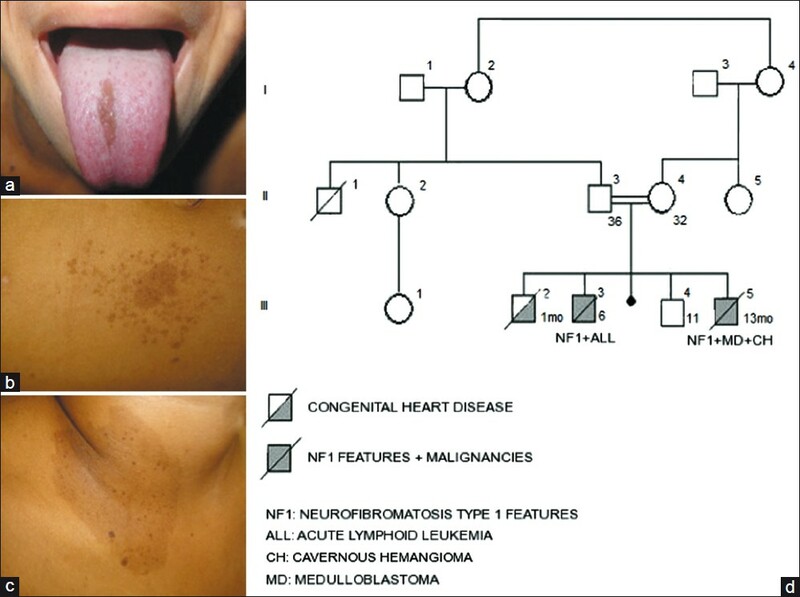 Neurofibromatosis and early onset of cancers in hMLH1-deficient children. Cancer Res 1999;59:294-7. 19. Ripperger T, Beger C, Rahner N, Sykora KW, Bockmeyer CL, Lehmann U, et al. Constitutional mismatch repair deficiency and childhood leukemia/lymphoma - report on a novel biallelic MSH6 mutation. Haematologica 2010;95:841-4. 20. Wang Q, Montmain G, Ruano E, Upadhyaya M, Dudley S, Liskay RM, et al. Neurofibromatosis type 1 gene as a mutational target in a mismatch repair-deficient cell type. Hum Genet 2003;112:117-23.